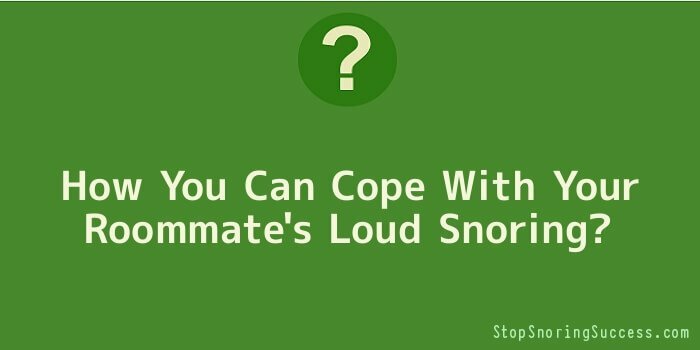 How You Can Cope With Your Roommate's Loud Snoring? How You Can Cope With Your Roommate’s Loud Snoring? You have been looking forward to college ever since you got the acceptance letter in the mail. Part of why you have been so excited is because you get to move out of your home and live with a roommate in the dorm. However, your excitement has dimmed, because each night you have to deal with the loud snoring of your roommate. You have spent enough sleepless nights now to realize that something must absolutely be done immediately about this loud snoring situation. How you approach this situation has everything to do with how well you get along with your roommate. If you and your roommate get along quite well, then you might be able to politely suggest that your roommate do something about his or her loud snoring. Your roommate might pay attention to your suggestion, and get something at the local convenience store, such as nose strips, that will get the loud snoring taken care of. However, if you and your roommate are already on strained terms, then things will only get worse if you make comments about his or her loud snoring. The first thing that you should consider doing is getting a housing transfer. For example, if someone leaves the dorms, you can get put on a waiting list in which you take that other person’s room. If a housing transfer is not an option, you can take a rather drastic measure against both the animosity and the loud snoring by leaving dorm life altogether. This option should only be taken if you can afford to do so, because the housing department of your college might not give a full or partial refund. You will thus have to find an apartment nearby. You can also take the most diplomatic route possible, by not saying anything and suffering in silence. This option is often taken by people under the correct assumption that since they are also paying for their space in the room, then they have their rights too! So, if you choose this option, what can you do to block out the snoring? The first option comes in the form of iPods or CD players. Simply play your favourite music as you try to sleep, and you will forget about the snoring. You can also get earplugs, which will get rid of all kinds of noise, not just snoring. Thus, with auditory resourcefulness, you can get a full night’s sleep without being bother by your roommate’s snoring.